Editor's note: This article appears in the Feb. 12 issue of ESPN The Magazine. Not even three years ago, back when Britney was still cute and people were excited about Zach Braff's movie career, two of my three favorite teams captured titles within a 14-week span. This was significant because, with a total of 92 MLB, NBA and NFL teams, I had about a 2.5 percent chance to root for two champs in the same year. (Note: I'm excluding the NHL because it held its All-Star Game on a Wednesday on a network called Versus. If we included hockey, we'd have to include Arena Football, MLS, National Lacrosse League, "Pros vs. Joes" and "Real World/Road Rules Challenge." Much easier this way.) The whole time, I was thinking, "Enjoy this. You never know when things might turn." To nobody's surprise, things turned. The Patriots lost control of the AFC to the Steelers and Colts. And the Red Sox morphed into a mirror image of the Yankees, earning the perpetual revulsion of everyone outside the East Coast. At the rate we're going, I'm expecting someone to break the story that Sam Malone used steroids. Can you imagine Greg Oden in green? Celtics fans are picturing it already. 1. Watching every televised game that features Greg Oden or Kevin Durant. 2. Rooting for the Boston Celtics to lose. Coming from me, that last one sounds sacrilegious, right? The Celtics are, after all, the third of my favorites. But my basketball fan's life changed during a surreal 24 hours in December, when Paul Pierce hurt his foot one day after his team failed to trade for Allen Iverson, killing any chance at the playoffs and shifting the priorities of many Celtics diehards. We realized that if the team kept losing, it could win the lottery. We have a term for a team that effectively gives up to increase its draft position -- "tanking" -- but nothing to describe when fans turn on their team for the same reason. Let me create one: "fantanking." Not only can you use it as a noun or as a verb, it sounds like a title of a Weezer CD. Like every other rational Boston fan, I turned my fantanking switch on just as the Celtics were slipping Pierce's foot into a protective boot. Less rational fans can't stomach the thought of fantanking, even when it's with the most noble intentions, because it makes them feel like traitors. This is one of the age-old dilemmas in sports, right up there with when you should stop bringing a baseball glove to games, when (or if) you should sell your baseball cards and when you should stop wearing your team's jersey in public. And there's no definitive answer to any of them except one: If you're older than 18 and you still bring your glove to games, you're a loser. Hate to break it to you. The fantanking debate caused a ruckus on my Celtics message board -- OK, maybe I shouldn't be calling anyone else a loser -- where one poster equated rooting against the Celtics to selling one's soul. Where does he get off? The Celtics long ago sold their collective soul by hiring Lucky the Leprechaun and bringing in the dance team that killed Red Auerbach. Other anti-fantankers argue that losing breeds losing, that a 20-win season could inadvertently contaminate our young roster. I don't buy this. Losing can't affect your body like radiation unless you're Ricky Davis. Some believe there's a karmic price for fantanking, as evidenced by Tony Allen's recent season-ending injury. I think this is complete crap. In 1997, San Antonio appreared to hold out a healthy David Robinson for the final few weeks and still landed Tim Duncan. Here's the most reasonable antifantanking argument: You're hoping for a series of losses that eventually yields a prize, only the prize isn't a sure thing. The worst NBA team has a 25 percent chance to get the first pick (unless it's Atlanta, which is banned from winning the lottery by a secret clause in the bargaining agreement), and about a 50-50 chance for a top-two pick. It's the ultimate hit-or-miss, like gambling your way to a million-dollar nest egg in Vegas, then heading over to the roulette table and putting everything on black. Within 10 seconds, all that hard work can vanish into thin air and leave you muttering, "That's OK, that's OK, that's OK," like one of those shattered "Deal or No Deal" contestants. Unquestionably, that's the worst-case scenario for the 2007 lottery. Those dastardly Ping-Pong balls could fail to cooperate, and we'd be stuck with Year 5 of Danny Ainge's rebuilding plan, which could easily last longer than the Iraqi occupation when everything is said and done. Then I watch Durant flash an endless array of offensive moves, or Oden put up another double-double with one hand, and it's like monitoring two guaranteed Megabucks tickets. These guys are mortal locks to be franchise players, on the order of LeBron or Yao. 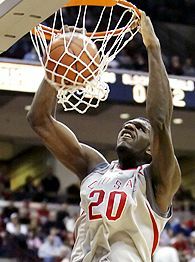 We knew Oden would become the best college center since Patrick Ewing, but nobody was prepared for the 6'9" Durant, an unfathomable cross between T-Mac and Plastic Man who can score facing the basket and from 25 feet away. I'm not ashamed to admit I'm in love with him. Platonically, of course. If there is any guilt, it's that I'm enjoying this whole thing a little too much. I spent a very pleasant recent night watching hoops, first rooting against the C's, who not only blew an 18-point lead to the Hawks but also lost Al Jefferson to a sprained ankle, and then for our chief lottery rivals, Memphis and Philly, who pulled off upsets in Utah and Cleveland. By the end of the night, the Celtics had leapfrogged the Sixers to move into a virtual tie for Ping-Pong pole position with the Grizzlies (which I know because I bookmarked the reverse standings on ESPN.com about four weeks ago). The only downer was that Jefferson's sprain turned out to be a mild one. We might need to start coating his sneakers with pig grease. All in all, another satisfying night of fantanking for a Boston sports fan. When my wife asked me why I seemed so happy, it didn't feel even the slightest bit weird to say, "Because the Celtics lost again."